Encoding – It is the process which refers to receiving the sensory input & transforming it into the code. During the process of encoding some changes are made in the sensory input for facilitating the storage . Storage – It refers to the process of putting the coded information into memory. Unless the storage is proper, it is not possible to get access to the information at a later period of time. However if done in systematic manner, information can be held for a long period of time . Retrieval – It refers to the process of gaining access to the stored & coded information . These three basic process are described as a theory of general memory function. 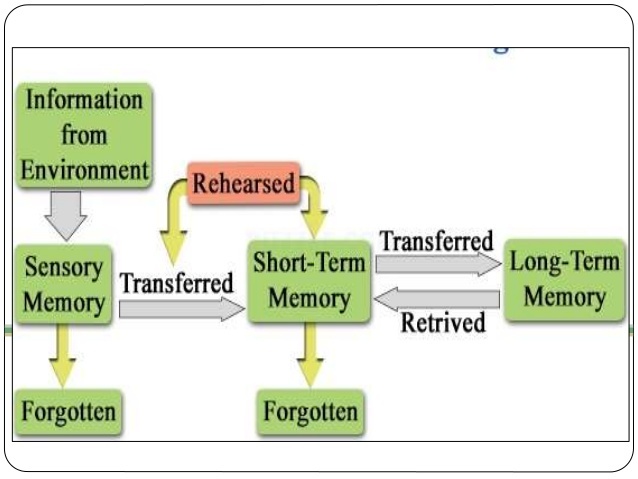 It is clear that there are distinct stages of memory (like sensory input, S.T.M and L.T.M) through which the information passes & that there are certain control Process (like attention,rehearsal etc) which determine, what information gets from stage to stage & what can be remembered later on.Let us now briefly elaborate the three stages of memory of the control process mentioned . Sensory Memory– Information which is always received in energy form is briefly held in sensory memory and is quickly lost by decay, however if we pay attention to it by recognizing it, the attended and recognized information reaches the STM for further Processing . Sperling(1960) has showed that visual sensory register hold the information for one second. According to Darwin etal, the auditory register holds the information for about 0 to 5 second. Studies have also shown that visual sensory register can hold at least 11 to 16 times of information during a second before it loses the information through decay. Further vision seems to be in the form of faint image called an iconic image. The residual sensory input that last for a short time after brief visual stimulus is called iconic memory & echoic Memory. It is a residual sensory memory that last for a brief period after auditory stimulus. 2) S.T.M is the memory that holds information received the sensory register for up to about 30 seconds, although the retention factor depend upon a number of factors. Glanzer & Cunitz (1966) found that recall is influenced by serial position effect. The better recall at the beginning of list which contributes to serial position effect is known as Primacy effect . Item encountered first are remembered well .The better recall at the end of the list is known as recency effect. Items encountered more recently are remembered well. STM has limit Storage capacity i.e 7+2 (Miller 1956). Storage capacity of STM can be increased by a process chunking. In STM, information is last as it is displaced by new incoming information .Before an information is lost from STM it is retrieved and used .In this retrieval Process we, rapidly scan through STM When Searching for an item of information . Rehearsal:- It Consists of keeping items of information in the center of attention, perhaps by repeating them silently or aloud. The amount of rehearsal gives to items is important in the transfer of information from STM to LTM. The more item is rehearsed the more likely it is to become the part of LTM. In past few years researches have shown that share amount of rehearsal may be less important, than the ways the information has been rehearsed. Just by going over & over, what is to be remembered,which is called maintenance rehearsal does it necessarily succeed in transferring it to L.T.M . Elaborate rehearsal involves giving the material organization & giving meaning as it is being rehearsed. It is active process & not passive process of repetition. 3) Long Term Memory –It has unknown & unlimited capacity. Some Psychologists are of opinion that no forgetting takes places in L.T.M. Information is always there, but we have trouble getting access to it as we are searching the wrong store house.